1. Wash and dry fish. 2. Mix salt and pepper in a small container and use it to Season the inner part of the fish. 3. Heat frying pan (preferably a heavy one) then pour oil into pan and heat very well. 4. Place fish in oil when very hot. 5. Turn on the other side is done when first side is done (will be nice, brown, and easy to turn). 6. 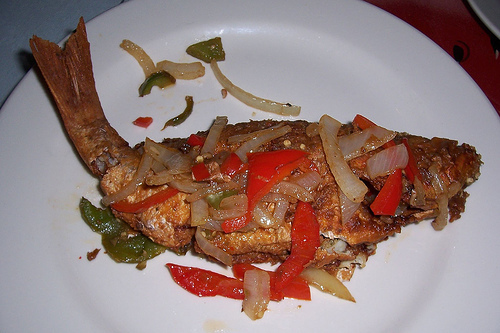 Place fried fish in flat casserole dish. 7. Add a small amount of water to the oil left from frying the fish. 8. Pour in the onions and pepper, let it boil for about a minute, then pour in vinegar and continue boiling until onions and pepper are nice and saute (in about a minute or two). 9. Pour this gravy mixture over all fishes and serve either hot or cold. 10. optional: To add a little zing to the flavor, I like to add a little tomato ketchup to the gravy while it’s being cooked and then pour it on the fish.